We have a number of wonderful horses and ponies, who have been selected to suit the needs of our customers and the terrain of the Moor. 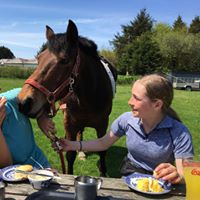 We keep a variety of sizes and types of horse and pony to best suit the needs of our riders and the terrain of Bodmin Moor. They are familiar with moorland wildlife, including cattle, sheep, buzzards and the occasional fox. They will take the changing terrain in their stride, but are equally keen to explore whatever lies ahead. We allocate the horses on each ride to suit the ride and the stated ability of each rider. To help ensure the excited riders listen to the very important instructions of our staff, each rider is given the name of the horse or pony they will be riding before entering the mounting area – so make sure you remember the name of your steed! Our horses and ponies have easy to remember names like Katie, Lucy, Freckles, Miranda and Smurf, just to name a few. 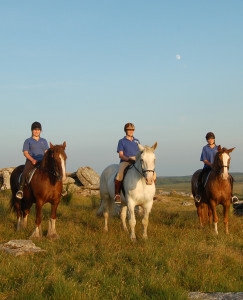 To find out more about our various rides and horse riding holidays in Cornwall, please call us on 01208 851500 or email us.